Welcome to the first installment of FPS Fridays! I'm planning on doing these at least twice a month to help give the site a better schedule for content. The basic idea is that I will be highlighting certain first-person shooters each week and giving my opinion on them. I think the FPS genre gets a somewhat deserved bad reputation nowadays, but there are some real gems out there. So without further ado, here is this week's game: Fistful of Frags. 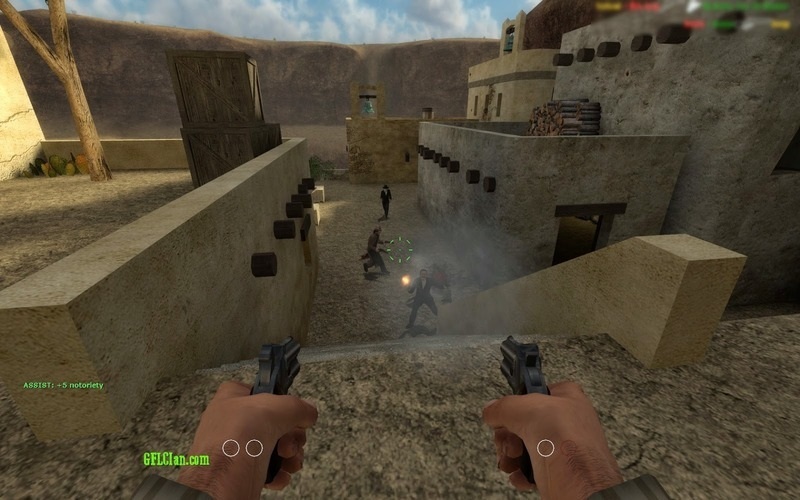 Out of all the themes for first-person shooters, westerns are surprisingly sparse. 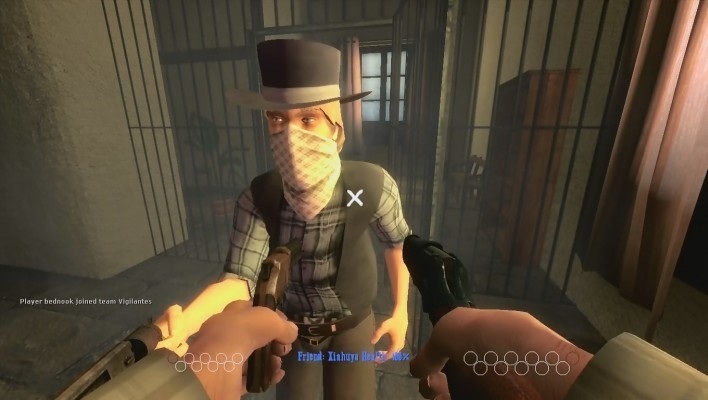 Fistful of Frags makes me wonder why there haven't been more western themed shooters. The game started as a mod for Half-Life 2 and is now available for free on Steam. There are a variety of modes, though none of them really break new ground. You have your standard free-for-all deathmatch as well as 2 and 4 team deathmatches. The most interesting modes are Teamplay and Break Bad. Teamplay takes a page from Team Fortress 2 and has two teams fighting for control points and pushing mine carts, towards the enemy base. The fast pace between rounds means it's always exciting while still encouraging players to work together. Break Bad is probably my favorite mode because it feels the most balanced. Each kill awards you money which you use to buy weapons when you spawn. It rewards you for doing well by giving you more money, but you have to manage it well otherwise you'll be stuck with nothing but your fists. Even the basic deathmatches have a twist to them in the form or the notoriety system. You gain notoriety for each kill, but better weapons give you less while the weapons that are harder to kill with give you more. Killstreaks are also rewarded, multiplying your notoriety when you get a chain of kills without dying. This adds just enough of a strategic element to make the game that much more interesting while still being simple enough to cater to newcomers. Of course one of the most important elements in any FPS is the gunplay and Fistful of Frags nails the source material. All of the weapons are what you would expect to see in the old west. From more primitive weapons like the bow or the hatchet to more advanced guns like the Colt Peacemaker and Pump Shotgun, everything feels great to use. Most of the weapons are rather inaccurate so you'll have to stand still if you want a good chance to hit anything. It sounds like a rather frustrating system, but in practice it makes the gameplay rather unique compared to other shooters. Upon spawning you can choose from a small variety of weapons to choose from as well as right handed, left handed, or ambidextrous modes. Choosing your dominant hand grants you an accuracy bonus when using a weapons in that hand. It doesn't affect the gameplay that much, but it is nice to have the extra element of choice. Do you pick left handed to have the best accuracy or do you want to be ambidextrous for more precise dual-wielding? The way you get better weapons is also fairly unique. Each map has a certain number of treasure chests that allow you to choose a weapon upon opening them. Blue chests give you starting weapons, red chests give you more powerful guns, and the gold chest gives you the best weapons in the game. Each chest has a cool-down period after being opened, so it takes around a minute for it to become usable again. Even with the most powerful guns death can come quickly, so no player is invincible. Overall, Fistful of Frags is a simple, but incredibly fun and addicting multiplayer experience. The western cowboy feel is quite charming and allows the use of some really neat guns from that era. For a free release it's very polished, not to mention the lack of microtransactions. If you have a Steam account, I encourage you to give Fistful of Frags a try, especially if you can bring a few friends along as well. I think it's inevitable that we'll all read some sort of review at some point in our lives. With so many products competing for our attention, it's only natural that we should want to know which ones are the best. Video games are no exception, and there are a multitude of different websites and magazines devoted to reviewing games. It has become commonplace to add a number to the end of reviews in order to rate and help people compare the games. The problem has become that these arbitrary numbers are all that really matters in a review anymore. The hours of time spent drafting and perfecting the words to describe whether or not a game is worth your time are cast aside by fanboys and companies who only care about the number associated with the game. I don't believe that scoring systems are inherently a bad thing, but what they have become in gaming culture is something that seriously needs to be addressed. So why is attaching a score to a review a bad thing and why does it need to be changed? Well the main problem about these scoring systems is the way they trivialize the actual written portion of the review. Go on just about any gaming website and look at the comments for a given review. It's all but guaranteed there will be hundreds of people complaining about how the game should have gotten a higher numerical score. Many of these people are simply there to create drama and controversy, but it does beg the question, why should we need a scoring system in the first place. The review itself should go over all the integral parts of a game: the story, gameplay, audio, visuals, and so on. At the end it should all be wrapped up in a short conclusion explaining the positive and negative points of the game. This is all we need. Giving a game an 8/10 doesn't actually tell the reader that much about the game or why it earned that score. A well written conclusion serves the same basic purpose in telling you whether or not the game is worth your time and money. By including a number after this, you're encouraging the reader to disregard what you wrote and to focus on the number instead. I'm guilty of skipping to the end of a review just to see the score myself, but I always found that reading the conclusion to discover why the score was given was more helpful. Aside from just being unnecessary because of the conclusion, the scoring system is also inherently flawed. Assigning a game a number simply doesn't work because there are too many variables. Any review of any kind is based on that person's subjective opinion. The reviewer can only give you their own thoughts on the game because it is impossible to be 100 percent objective. Much the same, the scoring system is subjective, so while the reviewer might interpret the number as meaning one thing, it may not mean the same to every reader. This has only been worsened by the fact that some major review sites only seem to use a portion of their own review scale, leading fans to believe anything under 80% is garbage. The review system is wildly inconsistent no matter which way you look at it though. More often than not a site will have multiple staff members to review games. By having multiple people provide reviews you effectively destroy any comparative use the scoring system had. While you should be able to compare two games and decide which one is better by their given scores, there is no way to do this effectively unless every review is done by the same person. Here's an example: Game A was reviewed by Employee #1 and received a 7/10. Game B was reviewed by employee #2 and received a 9/10. Clearly game B is better right? It got the better score after all. But you can't compare the two because they were reviewed by entirely different people. If the reviewers had swapped games the scores could have been changed radically. It's simply impossible to tell and it makes the entire system irrelevant. Worse than all these little annoyances is the atrocity that is Metacritic. Metacritic and other aggregate review sites compile review scores and average them out to give the "definitive" score. Sounds great, right? Wrong. These sites have become the way many people judge a game's worth. Yes, that is what the site was designed for, but it was not designed to be the end-all opinion for buying recommendations. The user reviews on Metacritic are also a joke. People will give out extreme scores just for the sake of affecting the weighted total. These kinds of practices also affect the publishers. Often a game's success is based on its aggregate score, being deemed a failure for not scoring high enough. There are other factors as well such as the quality of the sites Metacritic chooses to base its score on or the way it focuses entirely on the numbers. Like I said before, at the very least a score should be backed up by a summary explaining it. Metacritic is not focused on the why, it only cares about the number associated with a game. I can see how the site might be useful in theory, but what it delivers is anything but helpful. ﻿ This part doesn't have to do with review scores, but rather the reviewers themselves. One of the many things I dislike about the gaming culture today is the way many of these gaming sites pretend to be professional. To be a professional film or novel critic is no small task. There are fields of study devoted entirely to analyzing and dissecting the parts of those mediums. Gaming has nothing like that, and in fact, many of these reviewers specialize in journalism. There is nothing that makes them more qualified to judge the quality of a game than any fan who; no matter what they might have you believe. I'm not attacking every single reviewer or site out there, but there are some who pretend to be "professional" when that simply isn't the case. Sadly, it seems many people don't care about the content of reviews anymore and are simply seeking to find opinions that they agree with. If you're simply looking for justification of your opinions, then what's the point? Overall, I would encourage everyone not to place so much stock in game reviews and especially the numbers that accompany them. I wish people would come to realize just how superficial these scores really are. And in the end, does it really matter whether or not someone else likes a game as much as you do? Play what you love and love what you play. Until next time folks, keep gaming. Fire Emblem has had somewhat of a strange history in the west. Most people became familiar with the series thanks to two of its characters inclusion in Super Smash Bros. Melee. Marth and Roy quickly became popular and people started gaining interest in the Fire Emblem series as a whole. Seeing the success of the Advance Wars series in North America and Europe, Nintendo decided to localize the seventh installment of Fire Emblem for western audiences. While it is indeed the seventh game in a franchise that saw birth on the Famicom, it was simply titled Fire Emblem (I will be referring to it as Blazing Sword). Considering the series has spawned six sequels since with a recently announced fourteenth entry on the way, it's safe to assume this particular game was successful. Looking back however, is the game still enjoyable to play over ten years after its release? For those unfamiliar with the Fire Emblem series, it is a tactical role-playing game with RPG elements. If you've ever seen or played the Advance Wars series or even something like Final Fantasy Tactics or Tactics Ogre, then you'll have a general idea of the gameplay. The game consists of moving various units around a map to complete various objectives. The main thing that sets Fire Emblem apart from other strategy RPG's is the permanent death system. Basically, each unit in your army is unique. Unlike Advance Wars, you can't manufacture more units, so if one of your units dies in battle they are gone forever. This forces you to be extremely strategic, as you can end up losing valuable characters with no way to get them back. More so, it also helps to create a bond with the characters themselves. Each one has their own motivations and personalities, and you really get attached to them throughout the course of the game. There are other defining elements to the series as well, such as the weapons triangle, item management, and promotions. The weapons triangle works as a rock-paper-scissors game for your weapons. Swords have an advantage over axes, axes have an advantage over lances, and lances have the advantage over swords. It's a fun gameplay twist that just adds again to the strategic nature of the game. You also need to manage your weapons wisely, as each weapon has a limited number of uses and money to buy more is limited. Additionally, your units gain experience by fighting in battle. Every 100 experience earned levels that unit up for a chance to improve their stats. Each unit can go up to level 20, but upon reaching level 10 some units can use a promotional item to change classes. This provides additional boosts to stats as well as letting some units use new weapon types. 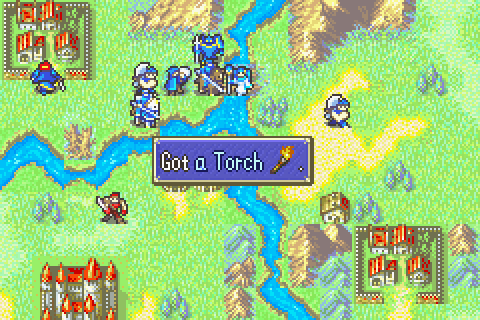 Personally, this is one of my favorite mechanics of the series and promoting a unit is incredibly satisfying. While each game in the series has slightly different features and additions, the core gameplay remains the same. It can be incredibly difficult and frusturating at times, but overall it is an incredibly rewarding system. While Nintendo usually tends to focus on gameplay driven experiences, Fire Emblem is a surprisingly narrative driven experience, and Blazing Sword is no different. The game starts by having you create a tactician profile used for a character in the game who represents the player. Yes, Blazing Sword had a player avatar before Awakening did, but I digress. There is no real customization for your character aside from the name. You don't directly control your tactician, and they are mainly present for the story. It's a strange feature, but it does give you some sense of immersion since characters will talk to you directly. Avatar character aside, the game stars three main lords named Lyn, Eliwood and Hector. Lyn's story serves as a short ten chapter tutorial, easing new players into the game and teaching them the gameplay mechanics. It stars Lyn, a young nomad from the plains of Sacae whose parents were recently killed by bandits. Thinking she has no family left, she discovers she is actually heir to the throne of Caelin. You follow her on her quest to reach the castle and meet her long lost uncle, with a few obstacles along the way of course. It's a simple, but charming story that really serves no purpose other than to teach newcomers how to play. Completing this gives you access to Eliwood's story which is the real meat of the game. It follows Eliwood on a quest to find his missing father, only to discover a sinister plot filled with twists and turns. Okay, so the story is actually pretty basic. I've never thought of the Fire Emblem series as being particularly strong in the plot department though. What really makes the story interesting is the characters, and Blazing Sword has some excellent characters. 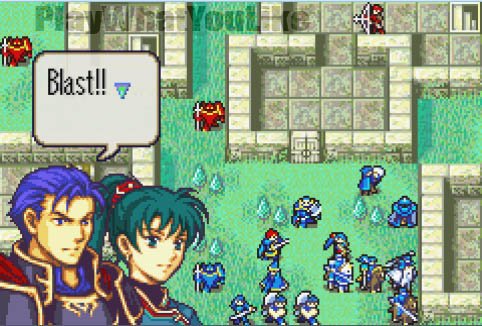 The main trio of Lyn, Eliwood and Hector are very entertaining, and they are backed up by a solid supporting cast. The story keeps things interesting across all 30 or so chapters, and none of them feel like filler content. It may be a basic tale about good vs. evil, but the story is still very engaging. One thing to note is that the game ends on a cliffhanger of sorts. The problem with this is that the story is actually continued by the previous game, Fire Emblem 6, which was never released outside of Japan. You can find fan translations of the game online, but it's still disappointing we never got the full narrative in the west. Gameplay wise, Blazing Sword is pretty much the quintessential Fire Emblem experience. All the staples of the series are here such as rescuing, the weapon and magic triangles, promotions, permanent death, and the trademark difficulty. Fire Emblem is a series known for its challenging nature, and paired with the permanent death system it can get extremely tricky. Thankfully, for the first Fire Emblem released outside of Japan the difficulty is fairly balanced. Don't get me wrong, this game is hard and I had to reset many times because of errant moves or enemy reinforcements I wasn't expecting, but it never feels unfair. Playing the same chapter two or three times can get frustrating, but you always feel like you have a chance and it's your fault if one of your units dies. Lyn's story serves as a great tutorial for beginners, though the amount of text can be annoying when you just want to get to the gameplay. Series veterans in particular may not find the prospect of sitting through the prologue chapters very enticing. Thankfully, after you've beaten Lyn's story once you can skip straight to Eliwood's story on following playthroughs. I think Nintendo did a really great job making this game accessible to newcomers without discouraging older fans. It's a great introduction to the series without sacrificing any of the depth and strategy you would expect from the series. The difficulty curve is also one of the most balanced in the series, providing a good challenge without ever feeling to overwhelming. As far as the audio and visual presentation go, it's pretty good for the Gameboy Advance. The graphics aren't pushing the system's capabilities, but the spritework is excellent and the environments are nice to look at. I really like the way each class has its own unique sprite, and the amount of detail in the battle animations is particularly impressive. The soundtrack is also solid, with some great compositions. While it may not be very memorable, the music is enjoyable and helps create emotion. You may not buy Fire Emblem because of the way it looks and sounds, but it still has a great presentation considering the system's limitations. In a series where the gameplay has remained relatively the same over 20 years, there's only so much you can do to make a game stand out. Blazing Sword may have more simplistic gameplay than some of its predecessors, but there's a beauty in that simplicity. It gives you just enough complexity to keep things entertaining without unnecessarily complicating them. But the real reason this game is so great is because of the story. It may seem like a cliche fantasy tale about knights, magic, and dragons, but there are enough plot twists to keep things entertaining. The roster of characters is excellent as well, and the main trio in particular are likable and funny. The addition of the player avatar also helps give that much more immersion into the story, and you actually feel like you are a part of it to some degree; rather than just watching the events unfold from the outside. It's hard to pin down just what makes this installment of Fire Emblem so engaging, but it just has a certain charm to it. It's the perfect place for beginners to try out the series, but seasoned players can also have a great time with Blazing Sword. If you own a GBA or a Wii U, then you should definitely give Fire Emblem a try. I consider this a must own for everyone's collection. Well here we are folks. I thank everyone who has stuck around this long just to read my ramblings. To get this high on the list, these games not only had to be great, but they had to mean something to me personally. Without further ado, here are my top 5 favorite games of all time! 5 Donkey Kong Country: Tropical Freeze - Despite being released less than a year ago, Tropical Freeze has quickly rocketed up the charts to become one of my favorite games ever. Retro Studios is a master of their craft, and they somehow managed to top the incredible Donkey Kong Country Returns. The jump to Wii U provides the game with impressive visuals that bring the colorful worlds to life. Speaking of color, the game is absolutely bursting with it, making for one of the best looking 2D platformers on the market. Make no mistake though, this isn't a case of style over substance, as the high pedigree of platforming from DKCR is very much intact for Tropical Freeze. The levels are more dynamic than ever, and look gorgeous in motion. Something is always happening to keep the action fresh and interesting, with an even greater variety in level design that in it's predecessor. While Returns focused one a singular island an created a rich, believable atmosphere upon that, Tropical Freeze sacrifices that atmosphere for 6 unique islands. While the atmosphere isn't as strong here, the range of levels and themes is much more diverse this time around. What does help the game's atmosphere is the return of series composer David Wise. He has crafted one of the absolute best soundtracks in gaming, rivaling even that of Donkey Kong Country 2. Overall, Donkey Kong Country: Tropical Freeze expands on its predecessor in the best ways possible. To put it simply, it is platforming at its finest, with fantastic levels, music, and visuals. If you don't have a Wii U, then you're missing out on this gem. 4 Yoshi's Island: Super Mario Advance 3 - Yoshi's Island is probably the game that defined my childhood. To give you an idea of just how much I played this game, I had amassed over 700 lives on my original savefile. I lost track of just how many times I played through the game, but it never gets old to me. There's nothing else quite like it, and it just has something special that many other games are missing. The gameplay is hard to describe. It's a platformer at heart, but it has so many other elements that all come together extremely well. I can remember so many of the levels in the game because of how fun they are and because of how much character they have. I think these are some of the most well designed levels in gaming, the kind that stick with you even after you finish the game. The spritework is extremely expressive, giving almost everything in the game a personality. Add in the music and you have a magical experience that hasn't been matched yet. I would try to explain further about why I love Yoshi's Island, but it's something that can't be put into words. It's an experience that everyone needs to have for themselves. 3 Metroid Prime - To me, atmosphere is one of the most important aspects in a game. Obviously, it is more vital to some games than to others, but whenever I think of a game with strong atmosphere, I think of Metroid Prime. The think that struck me about Metroid Prime is just how alive the world of Talon IV feels. When you first step out of your ship and onto the planet, everything is unfamiliar of foreign. What follows is a journey to uncover the planet's secrets and explore every inch of the ground underneath you. The exploration is very organic, and viewing the world through Samus' visor is incredibly immersive. You actually feel like you're exploring the world for yourself, through your own eyes. It's a very powerful feeling, and one that has yet to be replicated by any other game. And that's really it right there. Of course the gameplay is superb, blending in the exploration elements of the Metroid series with first-person shooting elements seamlessly. Gathering equipment to gradually become more powerful and gain access to new areas is just as satisfying as in previous Metroid games. The difference here is Metroid Prime's ability to fully immerse the player into its world. The ambient soundtrack does a great job of setting the mood for each area of Talon IV. The way the story is told is also very clever. It tells you very little outright, leaving you to scan the world around you and learn information for yourself. Metroid Prime is simply masterful, building a living, breathing world and letting you feel like you are actually Samus Aran herself. 2 Team Fortress 2 - Wow, talk about a surprise. I credit Team Fortress 2 with single-handedly getting me into the FPS genre as well as PC gaming as a whole. Before TF2, I had no interest in first-person shooters whatsoever. This game changed my mind with its bright, cartoony artstyle and wonderful characters. You get to pick from 9 unique classes, all with different weapons, skills, and personalities. And I think that's the key word here: personality. TF2 has lots of it, and it does wonders for the game. There is no story mode or campaign here, just an array of multiplayer modes. Unlike most other FPS games however, deathmatches are not the main focus here. Instead you have game-modes such as Control Point, where both teams fight to control a set of control points, Attack and Defend, where one team tries to defend the control points from the other team's assaults, and Payload, where one team pushes a cart towards the other team's base. Each mode encourages teamwork, and it's very difficult to succeed otherwise. Rather than have every player run off and fend for themselves, TF2 has players work together to achieve the goal. Every class is important, and a strong team needs to have balance. No game can even come close to the 700+ hours I have spent playing Team Fortress 2. The maps are all great, and really don't get old. Your experience with the game can vary depending on what the other players are like, but it also means that no two matches feel the same. I could go on about all the things I like about the game, but I want to finish this list so I can go play it some more. It's definitely the best game you'll never pay for. 1 Super Mario Galaxy - To explain why Super Mario Galaxy is my favorite game of all time, I need to tell a story. My first experience with the game was not actually playing it, but it left an impression on me nonetheless. On my friend's birthday, he and I, along with another close friend, all went to the store so he could pick out a game. After looking over the game cabinets at our local Walmart, he decided on Super Mario Galaxy. We immediately went back to the house to try the game, and to put it bluntly, my 14 year-old mind was blown. From the moment the game booted up and I was treated to the opening title theme, I knew this game was special. Simply watching my friend play through the game was amazing, each new galaxy filling me with awe. Super Mario Galaxy is really the only time I have ever been left speechless by a game. Everything about it was simply amazing to me, and still is to this day. Nintendo absolutely hit every aspect of this game out of the park. The presentation is some of the best on the Wii, and simply in general. The soundtrack is legendary, and probably the best Mario soundtrack to date. The controls are perfect and responsive, making controlling Mario a joy. The galaxies are bursting with creativity and it really feels like you're on a grand adventure through space. Some of you are probably wondering why I never mentioned the sequel, Super Mario Galaxy 2. To be honest, it could very easily share the top spot on this list, as it has everything that made the first game great, plus arguably better levels, but there is one small thing that puts the original Super Mario Galaxy above it for me. Remember that little thing called atmosphere I've been talking about this whole list? Super Mario Galaxy has absolutely perfect atmosphere, managing to capture the feeling of deep space and the loneliness that accompanies it. The use of dark, starry skies is a huge reason for this, as well as the Comet Observatory. While many people complain about the Comet Observatory, saying there is nothing to do on it and it takes too long to get around, that never bothered me because I serves a different purpose. Coming back to it after every mission and catching a break just peacefully floating through space is genius. Accompanied by an amazingly soothing piece of music, the Comet Obseratory serves more as a reminded to the player of just how grand their journey is. Each galaxy you visit and complete brings you closer to rescuing the princess, but you always have the Comet Observatory to come back to when you need a break. Something about Super Mario Galaxy resonates with me in all the right ways. I can't adequately translate the feelings the game gives me into words, but I'll just say it was a very special experience for me. I view Super Mario Galaxy as a perfect game, and also as my favorite game of all time. 10 Doom - Rip and tear baby! Nowadays First Person Shooters are all the rage, despite being incredibly linear, easy, and altogether boring (for the most part). Back in the 90's, shooters were quite different and Doom is the game that defined the genre. Blasting your way through countless hordes of hellspawn never felt as good as it does in Doom. All of the weapons have a great punch to them and the sound effects reinforce that feeling of power. The game definitely isn't a cakewalk. Not only do you have to deal with the legions of enemies, but the levels themselves are mazes requiring you to find keycards to open up doors in order to progress. The levels themselves are designed very well, making good use of darkness and ambiance to create a horror themed atmosphere that leaves you with a sense of dread. You never know what may be around the corner or hidden in the dark. Make no mistake though, Doom is an action game at heart and one that never gets old. Thanks to a dedicated fanbase, Doom has numerous source ports that update the graphics and controls to make it playable on modern hardware without any hassle. Most importantly however, is the modding community. These people have been making custom levels since the game's release in 1993. Having access to over 20 years of content means I'll be playing Doom for a long, long time. 9 Super Mario Sunshine - Mario sure knows how to vacation. I find that most people either love this game or hate it. Having grown up with Sunshine, it has a special place in my heart. While the story doesn't make much sense, that doesn't really matter because this is a Mario game after all. Platforming is what the series is known for and Sunshine delivers it's own unique spin on the formula. The new abilities F.L.U.D.D. gives you really open up the game into a virtual sandbox for you to play around in. Mario has never been this much fun to control or as maneuverable as he is in Sunshine. The atmosphere of the game is also perfect, and Isle Delfino looks like just the type of sunny, tropical island I would love to visit myself. The levels all feel organic and fit perfectly into the world, making the island very cohesive. While they are all based on the areas of Isle Delfino, there is still a great amount of variety on offer. Lastly, the soundtrack does an excellent job of setting the mood and makes you want to explore the sunny paradise. 8 Donkey Kong Country Returns - After years of being relegated to spinn-off games and experimental titles, Donkey Kong made his grand return to the limelight in this Retro Studios reboot, and what a return it was. After transforming the Metroid into a first person adventure with the Metroid Prime Trilogy, Retro decided to take DK back to his roots for an old school platformer. Not only did they succeed in reviving Donkey Kong, but they also crafted one of the best 2D platformers ever made. What sets Donkey Kong Country Returns apart from every other platformer on the market, even Nintendo's other series, is the level design. Plain and simple, the level design is head and shoulders above most other games on the market. Each level feels unique, holding its own identity, challenges, and features that set it apart from every other level in the game. While I love the older DKC games, often the levels felt too similar, like they were just tilesets thrown together. That's not the case here, and each level stands out as something memorable. The atmosphere is also perfect, making DK Island feel alive and natural. You actually feel like you're progressing across the island as you play through the levels. These aren't just 8 random worlds with stages, they're each a part of the island itself. Naturally, the visuals and music are also top-notch, but the gameplay takes the cake here. Donkey Kong may have been away for a while, but he sure knows how to make a comeback. 7 The Legend of Zelda: Ocarina of Time - Best game of all time? Maybe not, but it's still darn good. I didn't play Ocarina until the remake on the 3DS, and by that time I had heard quite a lot about it. I can safely say that the game lives up to it's reputation. There's not much to say here except that the game is extremely well designed and has aged almost flawlessly. All of the areas and dungeons are great, except for maybe the Water Temple, but even then it's not as bad as people make it out to be. The soundtrack is perhaps the most well rounded of the series, containing many recognizable songs. All in all, I would say that this is the quintessential Zelda experience. There's nothing bad I can really say about it, and enough people have already proclaimed its greatness, so let's move on. 6 Fire Emblem: Awakening - Fire Emblem is a series I was mildly interested in before Awakening. 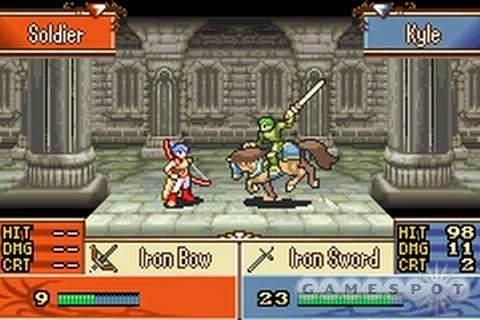 I played a little bit of Sacred Stones on the 3DS, and had just beaten Fire Emblem on the GBA. After trying the demo for Awakening, I liked it and nothing else was coming out at the time, so I decided to get the game. Nothing could have prepared me for the grand journey I was about to embark on. Fire Emblem: Awakening is a very special game for me. For starters, I played the game for almost 70 hours in a single playthrough. The game normally only takes 30 or so hours to beat, but I was so engaged with the world and characters that I didn't want the game to end. Many people have complained about the weak story of the game, and I'll concede that it's not the best ever, but that's not the important part of Fire Emblem; that would be the characters. I fell in love with the cast of characters in Awakening. Each one provides their own unique personality and learning more about each of them through the excellent support system is a joy. The ability to create your own avatar immersed me even more in the world; and I felt like I was actually a part of the adventure. All of the other aspects of the game are outstanding, and it truly feels like a celebration of the series, taking elements from many previous entries. I think one of the most telling parts about a game is when you feel a sense of sadness when it ends. Fire Emblem: Awakening is that game for me, and I didn't want to let it go, but I was grateful for the memories it had left me with. 15 Kid Icarus: Uprising - Talk about reviving a dead franchise. Masahiro Sakurai not only brought the Kid Icarus series back to life, but supercharged it in the process. Going from a simple 2D platformer to an on rails / third person shooter mix sounds insane on paper, but boy does it work. The flying sections are very similar to the gameplay of Star Fox 64, only much crazier and visually impressing. They serve as a nice warm up for the on foot sections, which I actually enjoyed more. The gameplay is given a nice sense of depth thanks to an abundance of different weapons for you to play around with. Whether you like getting up close for melee attacks or sniping off foes from a distance, there's a weapon type for everyone. This is all fine and dandy, but what puts this game on another level is the dialogue. Every character in the game has extremely well written lines with great voice acting to back it up. The banter between Pit, Palutena, Viridi, Hades, and my personal favorite, Thanatos, is unequivocally entertaining. Sakurai always puts his whole heart into every game he develops and it certainly shows here. 14 Kirby's Epic Yarn - How ironic is it that my favorite Kirby game doesn't even play like a Kirby game? That's not to say I'm complaining mind you, quite the opposite. While it may not have started off as a Kirby game, it still has all the charm the series is known for. Good Feel crafted an absolutely stunning world made from yarn and fabric. It really is a beautiful game with great attention to detail and it nails the concept. The gameplay immerses you in the patchwork world even further by allowing you to interact with parts of the levels. The levels themselves are a ton of fun to play through with creative designs such as a giant beanstalk, a jungle full of dinosaurs, a level made of instruments, and a very cozy cabin. There are also a number of transformations which take the place of copy abilities. The Fire Engine and Dolphin are especially fun, but they all provide a nice twist. The soundtrack is also excellent, mainly consisting of piano pieces. It may not be the hardest game out there, but it's bursting with charm and never failed to make me smile. 13 Mario & Luigi: Bowser's Inside Story - Despite being based on a portly red plumber best know for his platformers, the Mario & Luigi series are some of the finest RPG's out there. What makes Bowser's Inside Story stand out is the ability to play as none other than the Koopa King himself. That's right, for the majority of the overworld portions of the game you get to control Bowser, battling enemies, solving puzzles, and learning new abilities as you go. Of course, the Mario Bros. are present as well, but Bowser really steals the show here thanks to some masterful dialogue that gives him some much needed personality. In fact, the game is downright hilarious, keeping the fantastic sense of humor the series is known for. This game has everything you could ask for in an RPG and then some. 12 Mario & Luigi: Superstar Saga - Superstar Saga narrowly beats Bowser's Inside Story as my favorite game in the Mario & Luigi series. While Inside Story has better visuals and more refined gameplay, I prefer Superstar Saga just because of how weird it is. Rather than taking place in the Mushroom Kingdom, Mario and Luigi travel to the Bean Bean Kingdom, which is delightfully odd. It's a place that feels very foreign to what we are accustomed to from Mario, and I love it. This was also the game I feel gave personalities to Mario, Luigi, Peach, and Bowser. The Bean Bean Kingdom is also home to some entertaining characters of its own, with Popple and Prince Peasely being standouts. Everything else is what you would expect from a Mario & Luigi game, but the change in scenery helps it stand out and feel different enough from games that came after it. Also, Luigi is hilarious in this game. Seriously, just go play it for yourself. 11 Brothers: A Tale of Two Sons - If there was ever a game to showcase how a game can be an experience, this would be it. I don't want to say too much about it for fear of spoiling anything for those who haven't played the game yet, but it's an incredible journey to say the least. Over the span of 3 hours I was drawn into the story and world unlike any other game I've played. The gameplay consists of fairly simple puzzles performed using only two buttons. The twist is that you control both brothers simultaneously using both analogue sticks. Narrative is the game's true strong point however. Though the characters only speak in gibberish, it tells an extremely compelling story. More impressive it its ability to show the relationship of the brothers and how they grow along the journey, all without using words. Those three hours I spent in the game were the most engrossing and emotional I have ever experienced in a video game. This game is nothing short of a masterpiece and I highly recommend you play it. Obviously I don't expect to play through all these games in one month, but I aim to complete them as soon as possible. If you would like to join in the marathon or just use it as an excuse to play a game in the series you've never tried before, please do so and let me know. I will be posting my impressions of each game upon completion starting with Fire Emblem 7. 20 Mega Man 10 - The Mega Man series is one I that really doesn't need explanation. The simple fact that it has reached ten entries, not to mention numerous spin-off series, speaks volumes for the quality and lasting appeal. The only question is which one would make it on the list? For me, it was a close call between Mega Man 5 and Mega Man 10. Both games are viewed as somewhat lackluster compared to the likes of 2, 3, and 9, but in the end, Mega Man 10 is still my favorite game in the series. What really sets it apart for me is the darker tone and dreary atmosphere the game presents, which is a stark contrast to most Mega Man games. It really feels like everything is leading up to the penultimate battle with Wily. You've defeated him 9 times before, but this time it is going to end once and for all. Of course, this is all backed up with some of the best level designs in the series, a rocking soundtrack, and beautiful 8-bit visuals. Oh, and you can also play as Proto Man and Bass, need I say more? 19 La Mulana - I really had no clue what I was getting into with La Mulana when I bought it. I saw is had received positive reviews, so I went ahead and purchased it without any intention of playing it any time soon. A friend asked me to give some thoughts on it, any thus began my grand adventure into the world of La Mulana. Adventure really is the best way to describe this game. You actually feel like an adventurer, exploring new areas, fighting monsters, solving puzzles, and slowly unraveling the mystery of the temple. The journey is a very grand one, and it requires you to use your head and always stay on your toes. Nigoro crafted on of the most engrossing game worlds ever, and I was sad to see it go when I finally beat the game. If you have any interest in Metroidvania style games, 2D platformers, or just fantastic games in general, you can't go wrong with La Mulana. 18 Mega Man X4 - The Mega Man X series is somewhat overlooked when compared to the Classic series, and that's a shame. The most well known game in the X series is the original Mega Man X, but Mega Man X4 takes this spot on my list for a multitude of reasons. First off, you can now play through the entire game as everyone's favorite Maverick Hunter, Zero. This actually adds a lot of replayability since X and Zero have massively different playstyles along with unique abilities gained from defeated Mavericks. The upgrade to the Playstation brought beatutiful 32-bit sprites and CD quality music along with it. The cheesy anime cutscenes help tell a surprisingly entertaining story. Mega Man X4 truly is the full package, and is one of the most polished 2D platformers I've had the pleasure of playing. 17 Rollercoaster Tycoon 2 - Aside from basically being my childhood, Rollercoaster Tycoon 2 is just a ton of fun to play. Being a big fan of actual rollercoasters, having the ability to create my own crazy coasters is incredible. You can either take on premade scenarios with goals such as making a certain amount of money, having a certain amount of visitors enter your park, or keeping your park rating over a certain amount. If none of that tickles your fancy, you can create your own park from scratch with the game's expansive park editor. I always have a blast even when I'm just messing around with my park and building insane rides that none of the visitors are brave enough to ride. 16 Donkey Kong Country 2: Diddy's Kong Quest - The Donkey Kong series has always been one of my personal favorites, much in part to the Donkey Kong Country series. Of the three games on the SNES, the second is by far my favorite. For starters, it introduced a new partner: Dixie Kong. She is a lot of fun to use because of the hair twirling, gliding maneuvers you can perform with her. The game no longer takes place on Donkey Kong Island, but the dark and menacing Crocodile Isle instead. Because of this, the game has one of the best atmospheres in gaming. The island feels dirty, gloomy, and altogether depressing, much like you would expect an island ruled by banana thieving reptiles to be. This atmosphere is bolstered by the exceptional soundtrack composed by musical mastermind David Wise. I've praised the soundtrack of many games, but few come remotely close to this one. Despite being composed for a 16-bit console, it contains some really emotional pieces that are also incredibly catchy. The level design has also improved since the first game, partly in thanks to the more interesting locales. There are also an abundance of secrets and bonus rooms to find, so this game will keep you busy for awhile. Donkey Kong Country 2 has everything I could ask for in a platformer, and is not only one of the finest games on its system, but one of the best games you can play period. Wow, how original, right? Looking past the cliched task of putting one's favorite games into an ordered list, I thought I would join the club simply to share with you all my favorite games of all time. Why 25 games? There were too many games I wanted to include and talk about, plus honorable mentions are stupid. If you feel so inclined, feel free to leave a comment sharing your favorite games of all time and why you love them. 25 Super Castlevania IV - To me, Super Castlevania IV perfectly encapsulates the 90's gaming mindset. It's a simple game that doesn't mess around, throwing you right into the action while perfecting what the series was known for. Gone are the stiff and clunky controls of the previous games, replaced with controllable jumps and multi-directional whipping. This expanded control of Simon Belmont really pulls me into the game and makes me feel like a vampire hunter myself. Top it all off with creative level design and a killer soundtrack and you get the best classic Castlevania there is. 24 Solatorobo: Red the Hunter - If anyone ever asks the definition of an overlooked gem, this game should be it. Once you're past the strange title, you'll find a game packed full of quirky characters, unique gameplay, an engrossing story, and a fabulous art design. The gameplay itself is rather straightforward, but it's complemented by the beautiful hand-drawn backgrounds that make up the world of the Shepherd Republic. The story is great as well, with some really well written and lovable characters that add personality to the game. I bought this game for a mere $20 and it came bundled with the soundtrack as well (which is also outstanding by the way). I can safely say that this game is worth triple that price; please check give it a chance and I promise you won't be disappointed. 23 Pinball FX2 / Zen Pinball 2 - This is an odd choice for me because I am not that big of a pinball fan. The only real experience I had with pinball before this game was Space Cadet on Windows XP; a game I'm sure many others remember as well. The point is, Zen Studios made me fall in love with pinball despite not being a fan in the first place. Probably the most important aspect of any pinball game is the physics, and Zen Pinball nails it perfectly. Throw in some amazing original table designs and even some licensed tables based on Marvel and Star Wars and you get countless hours of fun. 22 Sonic 2 / Sonic Adventure - These two games share a spot on the list because I think they are both equally good in their own respective ways. While most people would probably say Sonic 3 & Knuckles is the best 2D Sonic game, I've always loved Sonic 2 just a bit more. It was a perfect sequel to the original Sonic the Hedgehog, adding many elements that are now iconic to the series, such as the spindash and Sonic's new buddy, Tails. All of the zones are a blast to play through, with a perfect blend of platforming and Sonic's trademark speed. As with all Sonic games, the sountrack and visuals are some of the best on the system and provide a real treat to the eyes and ears while playing through the game. Sonic Adventure on the other hand, is a deeply flawed game. Not only are there plentiful glitches, wonky physics, terrible voice acting, and strange design choices, but half the game you aren't even playing as Sonic. Instead, the campaign is spread across 5 story modes starring Sonic, Tails, Knuckles, Amy, E-102 Gamma, and.... Big the Cat. The less said about that last one the better, but the other characters aren't terrible, just not as much fun to play as Sonic. And that's why this game is on the list, because of how much fun Sonic is in this game. I feel that this was the perfect translation of Sonic into the Third Dimension. While future Sonic games would streamline the experience and focus on the speed, Sonic Adventure has much more expansive levels that truly feel like the 2D games, only in 3D. The way Sonic's spindash works in this game is incredibly fun to use as well, and can be used in all kinds of creative ways to speedrun through the stages. Although it may only be a small part of the game, I really liked the inclusion of the hub worlds. Exploring them really drove home the adventure part of the game for me, and I felt that much more immersed in the world. While it's far from a perfect game, Sonic Adventure is one I always have a blast playing, as long as I'm not fishing that is. 21 SSX Tricky - "Welcome to SSX Tricky! This is going to be very, very interesting." The game pretty much tells you what you're getting into right from the opening, and interesting it is indeed. Sports games were never my forte, aside from the occasional Mario Sports title, but SSX Tricky takes things to a whole other level. Everything about the game is over-the-top in the best way possible. Pulling off insane Uber Tricks and nailing that perfect landing to earn millions of points is one of the most satisfying gaming experiences I've ever had. Usually I'm not into high-score style arcade games, but SSX Tricky is so much fun to play and challenge yourself, especially if you have some friends along with you. I would come home from work and my brother would be waiting for me just so we could play together. Once you've mastered the controls and learned the maps, you can rack up some incredible scores, something I could spend hours doing. Once I get the chance to play SSX 3, this spot may very well go to that game, but until then, SSX Tricky is all I need. where has the fun gone in gaming? Recently while I was making the rounds on various gaming forums and comments, I noticed a disturbing trend. It seems like almost everyone these days is being incredibly negative towards games. Whether it be hating on franchises, specific games, or just certain parts of games, this type of attitude seems to be very abundant right now. Don't get me wrong, I know negativity is something that comes along with the internet in general, but why is it so common and why can't people simply enjoy things without complaining about them? I believe that a large part of this unsatisfied nature is due to the media and even the game studios themselves. Video game review sites are nothing new, and you're likely to find controversy about any game review in general. Much of the problem is because of the review scoring system, but that is a topic I'll be saving for another time. These video games sites have a tendency to hype up games before release, giving players unfairly high expectations. Developers are feed off of this hype and excitement as well, but it creates an unhealthy atmosphere. As with any kind of entertainment, not everyone is going to like the same things. While many people will enjoy the newest Halo, Uncharted, or Zelda, there are just as many people who may not enjoy it. The problem begins when these people feel the need to cut down the game or people who actually enjoy the game simply because they don't share the same sentiments. This leads to people who like the game defending it and bashing the person who doesn't like it, leading into utter ridiculousness and childishness. You see, we all don't love the same things equally and that's okay, but it doesn't make someone who has a different opinion inherently wrong because they don't agree with you. The problem with gaming culture today is the simple fact that we feel like everyone needs to like the same things we do, and if they don't, they're either wrong or just plain stupid. You could say that our society in general places too much emphasis on what other people think of us and what we like. There's nothing wrong with having a civil discussion with someone explaining why you like or dislike a certain game, movie, book, or whatever. People don't HAVE to agree with your opinions and you don't have to take it personally if they don't enjoy the same game as much as you do. Rather than getting caught up in console wars, PC elitism, or simply bashing a game, take a step back and think about what you enjoy. Games should be simple and fun. If you happen to love a certain game, then great! If your friend doesn't like the game, then that's okay too, that doesn't mean you can't still enjoy it. My message to you would be this: Don't play games just so you can find things to complain about or to try to convince people of your opinion. Play games to have fun doing something you enjoy. Rather than trying to pick a game apart and analyze what could have been better, think about what you liked and the experiences the game left you with. This spirit of negativity around gaming is getting old, and I think it's high time we all started thinking about why we play game in the first place: To Have Fun. Just a man with a love for games who wants to share his thoughts with the world. If you want to see what I'm playing at the moment, feel free to stop by my Backloggery.